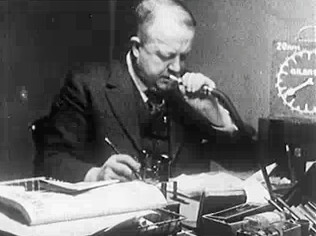 The “industrial efficiency” expert Frank Gilbreth (1868-1924) conducted his motion studies, both in the United States and abroad, in factories, offices, hospitals and other workplaces between about 1910 and 1924. 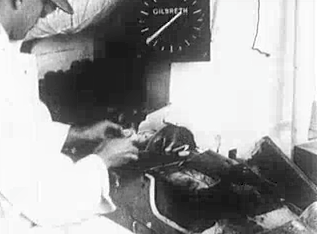 Gilbreth made his films with a 35 mm hand crank camera. The films below, despite their claim to be “original,” were actually compiled by James Perkins and Lillian Gilbreth after Gilbreth’s death in 1924. The original films are presumed lost. The above versions are silent and are from the Internet Archive; the Archives Center at the National Museum of American History has another, slightly different version, narrated by Lillian Gilbreth. Elspeth Brown, The Corporate Eye: Photography and the Rationalization of American Commercial Culture, 1884-1929 (Baltimore: Johns Hopkins University Press, 2005. Sharon Corwin, “Picturing Efficiency: Precisionism, Scientific Management, and the Effacement of Labor” Representations 84: 139-65, 2003. Richard Lindstrom, “‘They All Believe They are Undiscovered Mary Pickfords:’ Workers, Photography, and Scientific Management,” Technology and Culture 41(4): 725-51, 2000. Brian Price “Frank and Lillian Gilbreth and the Motion Study Controversy, 1907- 1930” in Daniel Nelson, ed, A Mental Revolution: Scientific Management since Taylor (Columbus, OH: Ohio State University Press, 1992), 58-73. Brian Price, “One Best Way: Frank and Lillian Gilbreth’s Transformation of Scientific Management, 1885-1940” (Ph.D. diss., Purdue University, 1987) and his “Frank and Lillian Gilbreth and the Manufacture and Marketing of Motion Study, 1908-1924,” Business and Economic History 18(1989): 88-98.